I read “I Let You Go” by Clare Mackintosh a few years ago and LOVED it. The author’s second novel “I See You” has been on my TBR for a while and I am looking forward to reading it too. 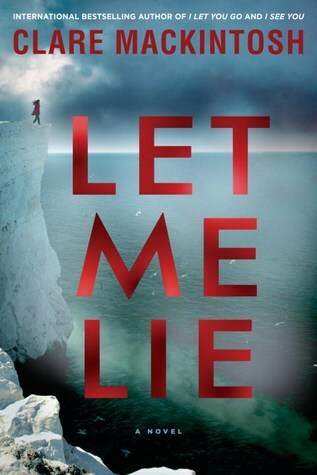 However, when the opportunity came up to read “Let Me Lie“, I was thrilled and couldn’t wait to get reading. Anna Johnson is trying to adjust to life without her mother and father. Her mother committed suicide a year ago, just a few months after Anna’s father killed himself. Although Anna still mourns her parents, she has a distraction…a new baby with her partner, Mark. They will soon be celebrating their daughter, Ella’s first Christmas. She wishes her parents were there to celebrate with them. She doesn’t understand how her mother, after seeing how devastated Anna was after the loss of her father, could put her through it again a few months later. She struggles to believe either of them could have done this. “They were the last people you would expect to give up on life”. Then on the anniversary of her mother’s death, she receives an anonymous card in the mail, with a message that is impossible to ignore. This message raises even more questions and Anna is determined to get some answers. But not everyone is happy with Anna digging around in the past, and she could be putting herself and her family in danger. Detective Murray Mackenzie is technically retired but works as a civilian at the police station, dealing with things like lost pets. The station has been so quiet lately and he’s been feeling rather useless. Then Anna Johnson walks into the police station. Will the detective be able to help Anna find out what she wants to know? What if she doesn’t like what she finds? So many secrets….so many lies. I found the first part of this novel pretty slow, but the story eventually pulled me in. There were some well-timed twists that really surprised me, though I did see a few of the others coming. I was also somewhat baffled by the ending. I’m not sure if I am over-analyzing it, but I’ve read it a couple of times and I’m still unsure. I loved Detective Murray Mackenzie’s story. His relationship with his wife, Sarah was incredibly heart-warming. How he helped Sarah with her struggles, how she helped him with his cases. A wonderful detective and an amazing husband, he was honestly my favorite character. While “I Let You Go” is still my favorite novel from this author, I thought “Let Me Lie” was an enjoyable read. I am looking forward to seeing what Clare Mackintosh comes up with next! I’d like to thank Berkley for giving me the opportunity to read this book in exchange for my honest review. It had some good twists and I really enjoyed some of the characters. I look forward to reading more from her. I’ve been so looking forward to this read! Though I agree with you that it’s hard to beat I Let You Go, this one sounds intriguing. Glad you liked it and lovely review!! Ooh this sounds good, looking forward to reading it! I loved her first novel but didn’t enjoy her second one so much! Hopefully this one will be better! Just wrapped this one up myself, and I really enjoyed it. Almost as good as her first, much better than the second. Can’t wait to see what she writes next! I’m glad you enjoyed it! I hope to have a chance to read her second one soon.